Planes outfitted with lasers have been probing the depths of Lake Superior for the past two months. Their mission? 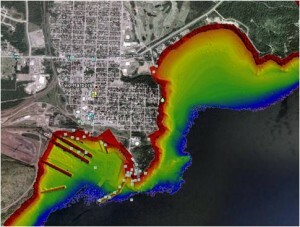 Measure lake bottom elevations along the coast using a laser surveying technique called LIDAR, or Light Detection and Ranging. The process is similar to how bats and dolphins use sound waves to judge distances. The planes shoot lasers into the water and measure how long it takes for the pulses to hit lake bottom and return; time indicates water depth. It’s difficult for research vessels to navigate shallow waters to measure depths along the shoreline. But planes using LIDAR can record water depths from 1 foot to 20 feet. Planes recently surveyed more than 600 miles of Lake Superior shoreline. The administration’s Coastal Services Center will refine the high resolution point data and release it to the public. Colorful maps of lake bottom elevations, like the one above, and digital models can be created from the data. The information is a boon to Great Lakes restoration efforts, according to a coalition of agencies participating in Great Lakes Restoration Initiative, a drive to restore the region. The data can determine erosion along Lake Superior and be used to clean up stamp stands, a byproduct of industrial mills that process ore for metals that have been dumped into the lake, according to the agencies. It also helps to know shoreline elevations when replanting coastal vegetation, Betzhold said. The information can also be used to identify existing fish habitats, Betzhold said. That’s because underwater fields of grass show up as patterns and textures in the data.